Thank you to all of the participants, many of whom bravely left warmer climates to travel to Minnesota in January! We'd also like to thank Baxter Larmon and Gregg Margolis who inspired us all to greater achievements; the folks at Regions Hospital and Mary Kay Margolis for their generous, professional support; and our gracious hosts, the staff of Inver Hills Community College. Lastly, we'd like to thank the entire FISDAP community for contributing the data that made the Research Summit possible. Thanks also to Brady for contributing to the 2006 FISDAP Research Summit. PDA interface allows easy student data entry in the field. Shifts and data are automatically downloaded with synchronization. Supports both Palm OS and Pocket PC. Students, click here to purchase this upgrade. Timothy Howey, a recent graduate of Inver Hills Community College, and a FISDAP user recently won the award for best research presentation at the National Association of EMS Educators annual symposium in San Antonio Texas. Mr. Howey presented two abstracts looking at the use of Eureka graphs for measuring competency, and the number of IV attempts needed by an average student to achieve competency. You can find Tim's abstracts in the research section of FISDAP. 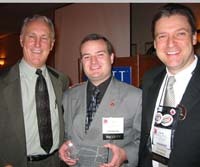 Timothy Howey, center in the photo above, accepted his award from Baxter Larmon of the Prehospital Care Research Forum with David Page of Inver Hills Community College. Thank you to all participating institutions and students for consenting to the use of their data for research. FISDAP will be at the NAEMSE Symposium in San Antonio, Texas. Come and visit us at the booth to see what's new, and to let us know how we can serve you better. See you there! All FISDAP users are invited to join us for a FISDAP user group meeting on Friday, September 9th in the Nueces Room between 6:00 and 7:30 pm. Be a part of the solution. Come join us to help form how FISDAP can help you more. To allow you to set different goals for different educational levels there are now 3 different reports to access: Program Goals (Basic), Program Goals (Intermediate), and Program Goals (Paramedic). To view the changes go to Reports and click on the Select Report Type drop box. The default values for the program goals remain the same but we have added more flexibility in setting ages for pediatrics, adolescents and geriatrics. You can see this by selecting the "Set Goals" link at the top of the report page. Under the Ages heading you can now set Peds Cutoff Age, Adolescent Start Age and Adult Cutoff Age. Simply adjust the ages as your program requires. We have also added an optional goal for adolescents. Thanks to everyone who has sent us feedback about what they need for this report . please continue to give us feedback at support [at] fisdap [dot] net. As another semester comes to a close please ensure that you are adjusting the graduation status of your students as necessary. Instructors can quickly access this by clicking on the administration tab and then the grad status tab. Students if you no longer have access to FISDAP check with your instructor to ensure the graduation date is entered correctly. If you have questions please contact support [at] fisdap [dot] net. As of 01/18/05 the FISDAP-Scheduler has the ability to allow programs to share available shifts with each other. The idea is a user at a given field or clinical site enters the shifts that are available at that site into the FISDAP-Scheduler. These shifts are then made available to multiple programs that have enabled sharing for that particular field or clinical site. When a shared shift is entered it becomes available to all the students for those programs and once one of the slots is filled, that slot becomes unavailable for all the students of the sharing programs. This allows for ease of scheduling students from multiple programs at a given field or clinical site. Instructors will note a new button in the FISDAP-Scheduler left side menu called “Share Shifts”. Clicking on this button will lead you through the process of requesting shift sharing. If you have any questions about the process please contact us at support [at] fisdap [dot] net. Once a shift is marked as complete you are able to audit the data. Please ensure that at a minimum 10% of the data has been confirmed with a signed off hard copy. After the student graduates and this audit goal is met, the "good data" flag can be set. This allows researchers using FISDAP access to the data to improve EMS clinical rotations of the future. The audit and good data information can also be quickly accessed through the Grad Status tab in the administration section. If you have questions please contact support [at] fisdap [dot] net.